I love all things pumpkin as well as the flavors of Fall. I have a huge arsenal of pumpkin recipes, but aside from my pumpkin Parmesan risotto, I don't have many savory pumpkin recipes and I decided that it was time to change that! You know that song “Scarborough Fair” by Simon & Garfunkel where they sing about parsley, sage, rosemary and thyme? Well – there were plenty of meanings to that song, but one of them is that the 4 herbs just WORK together and can create something amazing – and that is what I use in this pumpkin alfredo sauce! Combining the pumpkin puree with the cream is a little tricky because they really don't want to blend and make it easy for you! Because of this, I made the sauce in my 12″ All-Clad non-stick skillet and used a rubber scraper to “smush” the pumpkin on the bottom of the pan and quickly stir it in to the cream. It worked well! As always, I “toned down” the actual amount of garlic that I used, because my family loves garlic. If you love garlic as well, you might want to increase the amount! You will want to play with the herbs, based on your personal preference. I originally thought 1 tsp of Thyme would be enough (and it was certainly tasty with just that amount), but adding another 1 tsp of Thyme gave this pumpkin alfredo sauce a much earthier flavor. Start with what I have listed and once the sauce is hot, taste it and add more if you want! 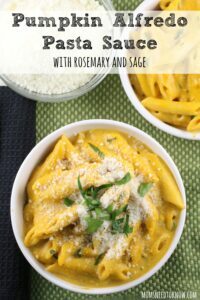 This pumpkin alfredo sauce recipe is a nice change from all the sweet pumpkin recipes that we usually see. A creamy and delicious way to enjoy pumpkin for dinner! Prepare noodles according to package directions. Reserve at least 1 cup of the cooking water in a heatproof measuring cup. Drain and set aside. Add the thyme, rosemary and sage and saute for another minute. Add the pumpkin puree, cream and salt and pepper. Heat, stirring often until the pumpkin has blended in to the cream. Add the parsley and Parmesan cheese and stir constantly until well blended. Add the cooked pasta and stir to combine. If the sauce is too thick, add some of the reserved pasta cooking water to "loosen it up" a bit. « Cheesy Philly-Style Beef French Bread Pizza | Great Game Day Recipe! This looks so yummy!! Thanks for sharing on the #MondayFundayParty Pinning to our group board. What a different take on this fall flavor! I love pasta so I’ll definitely be giving this a try! Thanks for sharing at Merry Monday, hope to see you again next week! What a great twist adding the pumpkin! Sounds yummy! Thank you for sharing on Merry Monday! Hope to see ya next week!